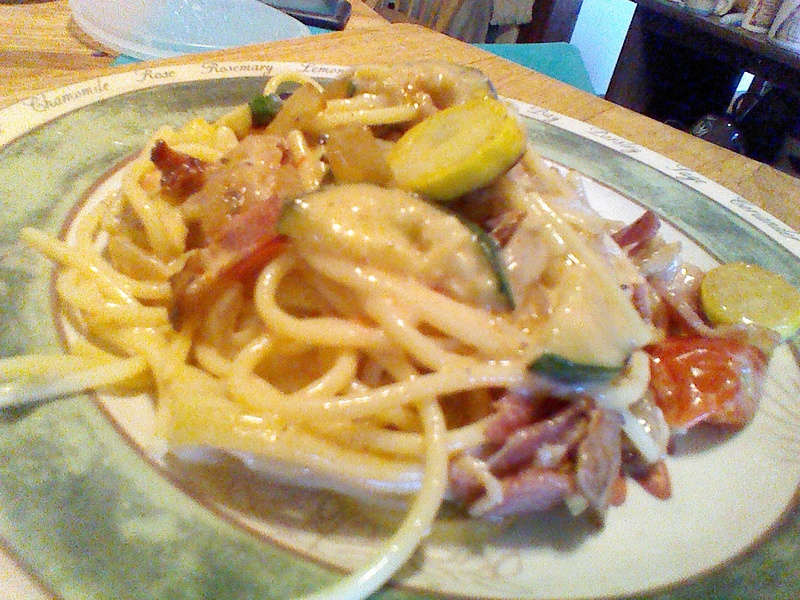 Spaghetti Bacon Primavera, the Bacon Fest Continues! The tomato season is winding down but I have a few around and I thought I would enjoy them with pasta at least once more. This recipe is a blending of two different recipes from two different cookbooks. One is a pasta primavera which has a creamy tomato sauce and fresh veggies and the other is a classical pasta carbonara with bacon and parmesan cheese. This is their offspring! Bacon primavera pasta, ta da! I have made and love both recipes but I wanted to have all their flavors together in one dish so I threw this together earlier this summer for the first time. It turned really quite yummy. I made it again tonight and my three year old grandson ate lots of it; he loves veggies. It was just so tasty that I had to have seconds. The photograph is of that second portion before I dove into its creamy, bacony goodness. So round up some garden veggies, a block of real Parmesan cheese, bacon and a decent box of spaghetti and whip this recipe up for a late summer treat. I used spaghetti but you could use any shape of pasta that floats your boat! If you are a wheat lover this is easy to make with your standard pasta off the shelf. Of course, I made it with GF pasta, Barilla to be exact and it really tasted like regular flour pasta when made with this sauce. Heat a large pan of salted water and cook the pasta until just barely al dente, drain. I do this cooking while I am cooking the veggies. Saute the bacon in a large frying pan. I used my mini wok which is great for many frying projects. Cook while stirring constantly, for 3-4 minutes until rendering the fat is well underway; say half done bacon. Add the onion and continue cooking while it softens. Stir often. After 3-4 minutes add the two kinds of squash. If you couldn’t get yellow squash just green is okay. Keep stirring! Cook a few more minutes until the squash is close to done. Stir in the tomato halves and cook 1 minute. Mix the cream, eggs and cheese in a bowl. Add the hot pasta to the frying pan and dump in the liquid from the bowl, stirring well. Turn off the heat as soon as you dump it in. Add the tablespoon butter, some sea salt and freshly grated pepper and stir a bit more. Serve immediately. If you like to guild the lily top with a good sprinkle of more grated Parmesan cheese. Last time I made it I used some sliced red bell pepper, sweet onion and green squash. Yes on tomatoes, no on bacon; vegetarian style for my god daughter. It was good but I think I prefer the bacon version. So it is totally up to you as to which version you prefer to create. I have also made it with half and half instead of heavy cream; works pretty well too. Last time I used 3 whole eggs as I didn’t want to waste the whites. I left out the butter this last time, forgot it; still good. I slightly overcooked my tomatoes in the latest version but they were tasty non-the-less. I think it is a very flexible recipe, just the kind I like! Enjoy an easy to throw together late summer Italian veggie feast!